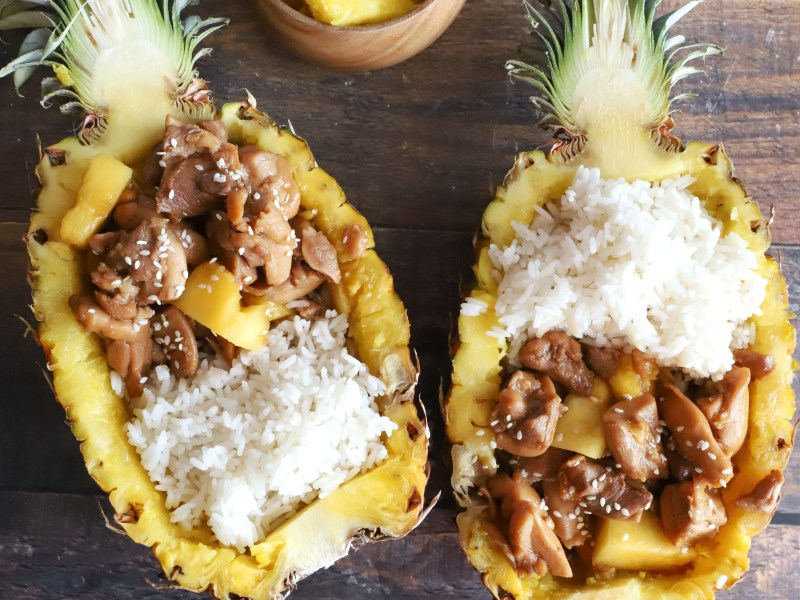 Pineapple, pineapple juice, and brown sugar provide the sweet, while soy sauce, hoisin sauce, and garlic provide the savory counterbalance in this terrific chicken recipe the whole family will love. Paired with hot rice, this will have you kicking the carryout sweet-and-sour dishes to the curb in favor of fresher flavors on display here. The pressure cooker keeps the chicken tender. You’ll be glad for it when it comes time to clean the kitchen after dinner, too! Spread chicken into the bottom of your pressure cooker pot. Stir brown sugar, pineapple juice, soy sauce, chicken stock, hoisin sauce, and garlic together in a bowl to dissolve the sugar completely; pour over the chicken. Lock pressure cooker lid in place. Set steam vent to Sealing. Select Pressure Cook (Manual) and cook for 7 minutes on High pressure. Set steam vent to Venting to quick-release pressure. Press Cancel. Remove chicken with a slotted spoon to a plate. Stir cornstarch into water in a small bowl to dissolve; stir into the liquid in the pot and cook, stirring frequently, until thickened, about 3 minutes. Stir chicken and diced pineapple into the sauce to coat. You could use canned pineapple and the juice from the can, but definitely consider fresh pineapple and a separate juice when making this. The pineapple will have a little more snap to it and provide a nice textural contrast to the chicken. Plus the pineapple juice simply has better flavor than what is used to can the pineapple. 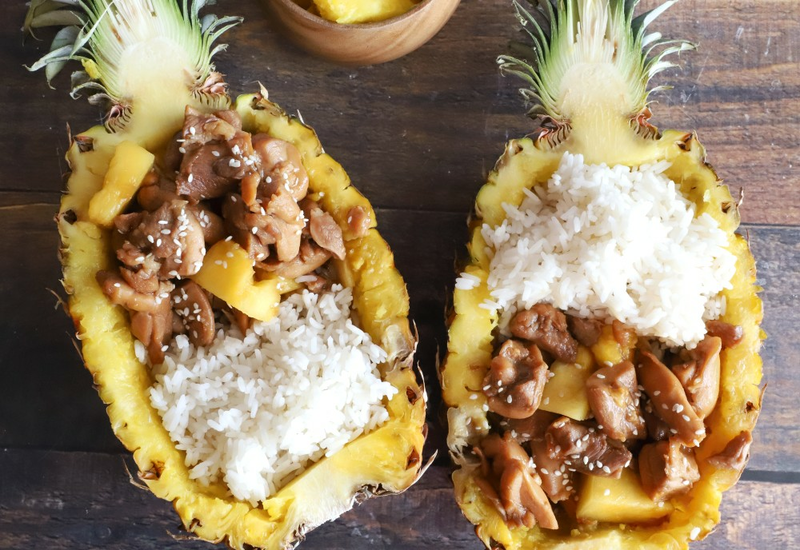 Use a hollowed pineapple to create a pineapple boat for serving the rice and chicken. Per Serving: 716 calories; 19g fat; 78.0g carbohydrates; 61g protein; 274mg cholesterol; 1526mg sodium. Really delicious! To add some heat, I also used thin jalapeño slices, which I mixed in at the end. I also garnished with diced green onions. This is perfect for entertaining, my friends love it when I make this recipe. I used 6 chicken thighs instead of 8, and I think it was the perfect amount for two servings. I also didn't add any diced pineapples at the end. I just served chicken with rice in the pineapple bowl. Very good! This was a really easy recipe to make in my Multipot. I used pineapple juice from a can, but did use fresh pineapple and made the pineapple boats to serve. Delicious! I used canned pineapple juice and light brown sugar to make this delicious chicken recipe. Brown rice was the perfect compliment to this dish. The one thing I'm most impressed with is not flavor, but how tender the meat was. Cooking with a pressure cooker ensures the meat won't dry out. Loved it! I made this sans the brown sugar (I used honey), and it was sweet, sticky and delicious. The meat was really tender, one of the perks of using a pc. I served it with plain white rice right out of the pineapple bowl just like the picture. Yummy! Totally great recipe! The chicken was moist and loaded with flavor. I don't buy chicken thighs, so I substituted with cubed up boneless skinless chicken breasts. I read that (1) boneless skinless chicken thigh is about 3 ounces of meat, so I used about 24 ounces (1.5 lbs) of chicken breast to replace the 8 thighs. It worked great! Awesome recipe. I added some red pepper flakes for some heat. My whole family loved it even my Daughter who fights eating. She even had seconds. So good! Entire family loved it and have enough for lunches tomorrow.